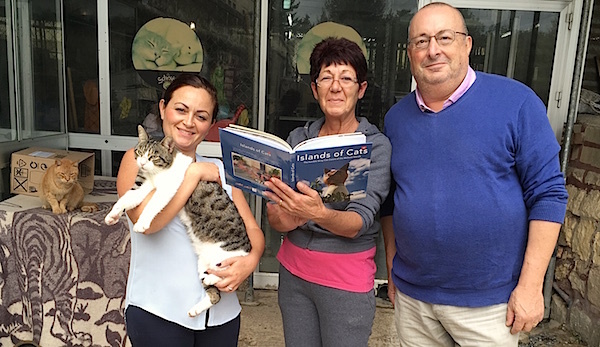 The team at the Tomasina Cat Sanctuary in Luqa were busy cleaning when we arrived to present their copy of 'Islands of Cats'. However, Jane, the Sanctuary Manager, and Elaine, a regular volunteer, happily took a break from their chores to accept the book on behalf of the Sanctuary. 'Thank you for including us in this wonderful book', said Jane. 'It makes us feel good when our work is acknowledged.' Which made Gabi and me feel good too! You can read more about Jane and the Tomasina Cat Sanctuary in 'Islands of Cats' on pages 59-63.